Click here to go to the Mr. and Mrs. George Ward Commemorative Quilt Trail blog in the Wardsville area. Lots of information there. commemorate their community’s founders, Mr. and Mrs. George Ward. The initial idea came from Denise Corneil, an artistic community leader, who had caught sight of the rural folk art phenonomen called “barn quilts” that are sweeping the United States. She was impressed by the news that the Temiskaming International Plowing Match 2009 in northern Ontario had created a barn quilt trail featuring over 90 barn quilts. 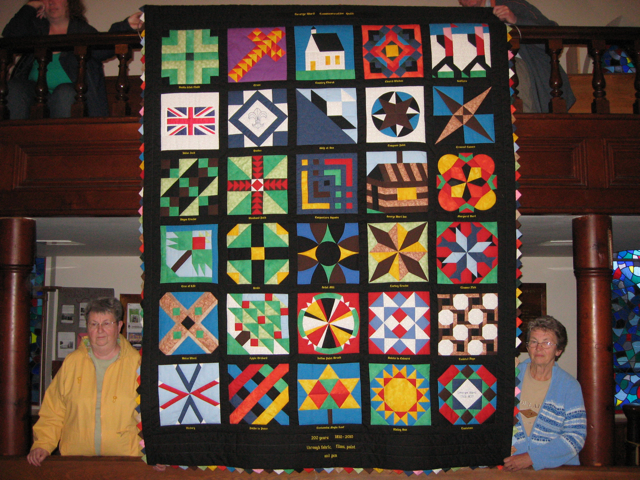 Eleanor Blain and Sue Ellis, experienced quilt makers, joined the team and quickly came up with a scheme to create a quilt involving as many women as possible. It did not matter whether they were skilled needle workers. It was a communal project which involved as many mothers and daughters as possible. They wanted a story line for the quilt. Ken Willis, the local historian told them the story of George Ward. In 1810, Mr Ward was requested by the British Government to establish a stopping point for travellers along a section of Longwoods Road between Thamesville and Delaware, in Upper Canada – the Western District it was called. A retired soldier with a young family, Mr. Ward was asked to supply provisions and fresh horses for the military. We are so pleased to have this information about my mothers ,Lela Elizabeth Ward Smith, great, great grandfather George Ward. As my siblings and I were growing up, we spent a lot of time in Wardsville, visiting my great Aunt, Ila Quigley. We stayed out at the Ward farm many times. A lot of the stories my mother would recall to us over the years, is again coming to life through this quilt trail. Thank you so much for all your hard work, and continued success with this endevour. Thank you, Linda Smith Pavao.